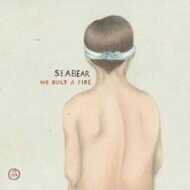 There is something instantly familiar about Seabear's songs that resonates with fans and critics alike. Despite scant promotion and airplay behind their debut album release, 2007's The Ghost That Carried Us Away, their songs and animated videos were a social media hit generating millions of plays. It's a very Icelandic DIY setup - their music is recorded by the band in their basement studio with its apple carton covered walls. Seabear - I'll Build You A Fire from seabear on Vimeo.